Its definitely getting colder out and my body is craving comfort food...all.day.long! 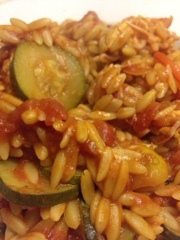 I'm a new convert to Orzo since making the wonderful roast chicken and orzo which was a Nigella recipe. The other night I decided to create something new and threw everything into a pan (hence why there are no photos of the prep stages). Brown chicken and onions, add courgette and spices. Add tinned tomatoes to chicken pan and boil to reduce tomatoes. 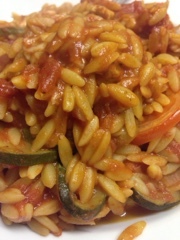 Once cooked, add orzo to the tomato sauce. And hear through. Put a layer of the mixture in an oven proof dish. Then evenly add half the mozzarella and cover with another layer of orzo mix, dot around the rest of the cheese and add slices of tomato on to the top. Baked in the oven for 20 minutes...this is just to melt the cheese and brown the top. Serve in a bowl with garlic bread on the side to mop up the excess sauce.